Wells Fargo team member Dan Cuniberti’s wife, Beth, cleans up where their house once stood. Dan Cuniberti never expected to be the victim of a natural disaster. But in the early hours of Oct. 9, 2017, Cuniberti, a Merchant Services account manager for Wells Fargo, and his wife awoke to their neighbor pounding on the window and ringing their doorbell. Wildfires in Northern California were quickly approaching, forcing his family to evacuate their home in Santa Rosa. 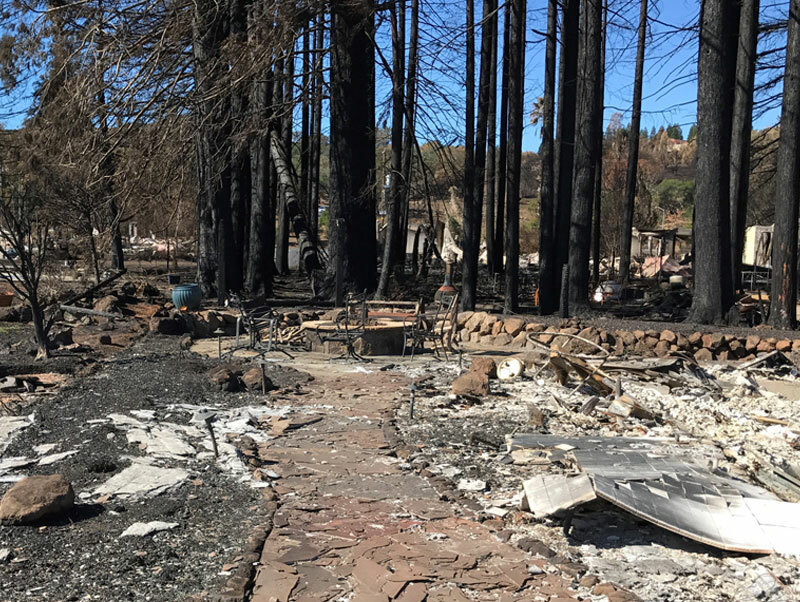 The fires ultimately burned more than 240,000 acres, destroying almost 9,000 buildings and killing 44 people, according to the Environmental Protection Agency (PDF). Cuniberti and his family lost their home of 16 years. Fortunately, they received help from Wells Fargo’s WE Care Fund, which was established in 2001 to provide grants to team members experiencing significant financial hardship as a result of a natural disaster, family emergency, or other unexpected events. After the fires happened, my manager got me some information on the WE Care Fund, and I talked with someone in that program. I wasn’t aware of it. I didn’t know Wells Fargo had a program like that. It felt good to know that Wells Fargo was there for me. The financial gift was important but just as important was knowing that Wells Fargo and the WE Care Fund was there for us. From 2001 through November 2018, WE Care has awarded more than $18 million in grants to more than 11,000 Wells Fargo team members. After being woken by their neighbor the morning of the fire, Cuniberti and his wife went outside, smelled smoke, walked a little farther, and were then hit by a wall of smoke. We were woken up around two o’clock in the morning. A neighbor was pounding on our window, and we got up, looked outside, and we saw smoke and flames up on the hill. So we grabbed the kids, grabbed a couple things, got in the car. I remember looking back at the neighborhood and kind of being in disbelief that that was the last time we’d ever see the house, and turns out it was. Cuniberti and his wife woke their daughter, who was 11 at the time, and their son, who was 8. They spent a few minutes grabbing two photo albums and journals they keep for their children. 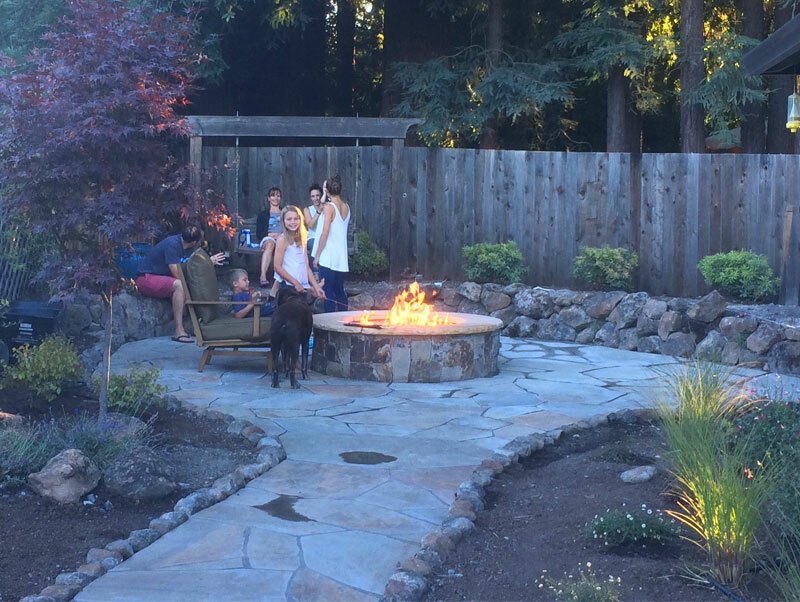 The backyard of Dan Cuniberti’s house before and after the Northern California wildfires of October 2017. Cuniberti and his family arrived at a hotel in San Rafael, California, around 3 a.m., only an hour after they had first woken up. For the next few hours, they were on social media trying to gather what information they could. Around 4:30 a.m., Cuniberti’s friend who had driven through the neighborhood called to tell him his house was gone. “We expected it, but that was the final word we got,” Cuniberti said. The front of Dan Cuniberti’s house after it burned down October 2017. I’ll never forget it. Beth and I got out of the car, walked up the driveway, and as soon as we stepped onto the front porch, my wife just broke down in tears. Everything we owned was just in a pile of ash on the floor. I mean, it was just gray dust everywhere, and that’s all you could see is chimneys. All the trees were gone, all the houses were gone, and it was just, yeah, I mean, it, it was heartbreaking. He and his wife tried to sift through the ashes to recover family heirlooms, but they weren’t able to get much. They were grateful to find some ceramic coffee mugs their children had made them and cast iron pots that belonged to Cuniberti’s great-grandmother.